'The Kid He Came From Nazareth' (not "Hazareth" this time) was cleverly combined with a traditional Russian folk song, retitled 'Russian and Chips', covered by Jack Hammer and released in April 2005 on the album The Pilgrim. 'Tribal Fence' was also covered on the same album. It all began one manic weekend in 1970 in a recording studio in Johannesburg - and when it was over Astra, one of the greatest rock albums to ever come out of South Africa, had been born. While the cream of the country's finest bands were strutting their stuff at a rock festival at the 'Out of Town Club' a few kilometres away, Freedom's Children were hard at work laying down the tracks for what was to become their seminal album - a powerful symbol of the rock creativity that flourished in South Africa in the early 70s. It took three days to completed album, from recording to final mix, but little did anyone involved in the project realise then that what had happened over that magic weekend would live on more than three decades later. Said Nic Martens, one of the engineers for Astra who also played organ on the album, in an interview in July 2000: "What many are unaware of, is that Astra was recorded from a Friday night, to the Monday morning…on a four track Studer, eight fader Siemans valve mixer, an echo plate, with some help from a Lesley amp and a modified echo box." This may sound archaic today when powerful software is freely available for anyone with the technical ability to create music using a PC. Seen in context, this makes Astra, if it is possible, even more remarkable. Not only did the album capture for posterity the unique sounds - dubbed "astral music" or "acid rock" - of arguably South Africa's finest band ever, but it also caught the mood of the drugs infused culture that had taken root on the southern tip of Africa in the post Woodstock love and peace era. From the driving lead of Julian's lead guitar, a perfect match for the amphetamine and speed culture of the day, to the surreal, trippy sound of the band that tuned into the growing use of LSD, Freedom's captured the mood and the sounds of the early 70s South African music scene. Not for them the hit parade sounds of the Beatles, Beach Boys and the Monkees. Instead - freakily unconnected in isolated apartheid South Africa - Freedom's, like Pink Floyd, the Grateful Dead and Jefferson Airplane on other ends of the globe, were experimenting with creativity and musical styles that tapped into the new head spaces opened up by the growing worldwide drugs and psychedelic culture. But the seeds for Astra were planted well before that crazy weekend in 1970 when, two years earlier the band headed off for the testing grounds of England to seek fame and fortune on the international stage. So it was that Julian Laxton, who with his magical "black box" was responsible for Freedom's trippy sounds, Ramsay Mackay, a tortured poet and the man responsible for penning the music and lyrics to some of the band's greatest songs, drummer Colin Pratley and Harry Poulos, found themselves in London. But from headlining their own sell-out gigs back home, the band - from hated apartheid South Africa and unable to legally work in London - were frustrated and unable to work. Says Julian: "We had time on our hands. We got to see lots of gigs, but frustratingly we could not play so we had lots of time to practice. We started working on a new album, which was to become Astra and half of it was written while we were in England. "By that stage I had invented a gizmo, which was the beginning of my black box. I took it around to some music shops and got some interest from a company that was keen to develop it further and produce a prototype." In return they gave us a place to stay and some music equipment, which is how we came to start working on Astra. It took about eight months of experimenting and hard practice to get it right. "When we finally recorded the album back in South Africa we had no idea then of what it would become, it is sheer magic," says Laxton. "When I listen to it now it still brings tears to my eyes, it was the very essence of our creativity at its peak. "We could do what we wanted, just about everything was patched into the 'black box', the Hammond organ, the piano, the vocals and the guitars. All the phasing, the echoes, all the effects, were the black box. Today these effects would be simple, but certainly not then. So, is the urban legend that Pink Floyd made use of any early black box - and may even have been influenced by some of Freedom's work, true - or just an urban legend? I want to know. "When we were creating Astra we were not aware of anything other than what we were doing, we put our hearts and souls into it. They had developed in England, and we were from the other side of the world. We both developed separately and in our own ways," says Julian. When the album was finally released in South Africa in 1970 it was an overnight sensation and set new standards for local bands. It was also an album, as time has proved, that would not go away. Since it's first release on vinyl in 1970 and on cumbersome 8 track a year later, Astra has been re-released six times over the past 34 years (including this latest Retro Fresh CD.) It also has the distinction of being one of the only - some say the only - South African album to be released in four different formats: LP, 8 track, cassette and CD. Behind this is a remarkable story of an album that would not die: a few years after it's release all the master tapes of that magical weekend were destroyed in a fire at EMI, which also saw the destruction of many of the original masters of Hawk's recordings, as well as other important South African musical history. It has survived because of the dedication of many people who fell under the spell of Astra. Amazingly, at that time there were many requests for the now unavailable "Astra" - some even from as far as San Francisco. Some of these people were willing to pay just about any price for a virgin album. It was then, said Julian, that he and Patric, with the help of Phill Adoire (Engineer at Orange Studios in Orange Grove, Johannesburg), decided to remaster Astra from a virgin copy of the original album. It was released on both vinyl and cassette - but the album bombed, selling only a handful of copies, and was subsequently deleted by EMI from their stock. Then, in 1993, came a rather poor unofficial German re-issue, but it was a flawed product recorded from a poor quality copy of the original 1970 album. And then in 1997 it was again re-issued on CD by David Marks for Gallo on CD using van Blerk's and Laxton's remastered album as a basis, which is where the matter rested until this latest CD you now hold in your hand. This time round, its Benjy Mudie of Retro Fresh, who has re-mastered the CD - using van Blerk and Laxton's 1990 vinyl album. And, says Laxton, it is the closest yet to the original. "When it was first remixed from an original vinyl copy in 1990, it was done on a 16 track. When we filtered out the surface noise and re-eq'd the upper mids to brighten up the tracks, the sounds that were hidden on the original came out. I was not very happy; the original had a mystical-mist shrouding the music, which was lost in the remix. It unlayered the music, but this latest CD is much truer to the original." But beyond the music, the stories surrounding the album encapsulate the madness, the bizarre setting, to what was apartheid South Africa at the time Astra was made. When the original album was ready and samples cut, Freedom's were suddenly faced with the prospect of it not being played on radio after the national broadcaster, the SABC, ruled that one of the tracks, The Kid Who Came From Nazareth, was blasphemous. Says Julian: "It was a huge problem, the album was already cut and processed and the covers printed, but the SABC would not give us airtime. So we went back into the studio and "fixed" the song, replacing the word Nazareth with Hazareth. 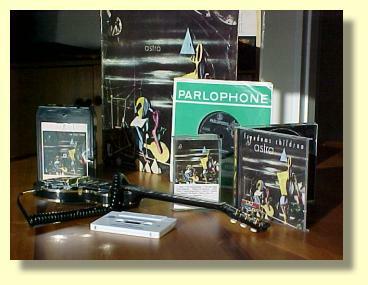 The album covers were also reprinted, and only then were the SABC happy. Equally bizarre was an objection by the SABC to the name Freedom's Children right at the beginning of the band's career, with the national broadcaster objecting to the use of the word "Freedom". Only when they changed the name to Fleadom's Children", used on several early 7-single releases, were the SABC's policies satisfied. Two of these songs, Freedom's debut single in 1967, The Coffee Song, and its B-side, a cover of the Rolling Stones' Satisfaction, originally released under Fleadom's name, as well as the 1968 single Little Games, are included on this new CD. Along the way, the band also had to deal with Mother Grundies who said the band was evil and their music would turn the youth into drug-crazed addicts. It was a time in South Africa when it was common practice for bands to tour widely, playing live at clubs, bigger gigs and festivals and Freedom's created controversy and headlines wherever they went. And, as they toured the country, city fathers and local police in some small towns often banned them. Besides the trippy sound of their music, their image of bad boys was spurred on by their liking for long black capes and publicity photographs that pictured the band in graveyards. From its earliest beginnings way back in 1966, Freedom's Children (briefly Fleadom's Children) went through many changes in its line up, as some of the country's finest musicians passed through its ranks. Something of a local version of John Mayall's Blue Band - a nursery for some of rock's finest musos - many of South Africa's top rock musicians did stints in the constantly changing line-ups, with many going on to form some of the biggest bands of the day. Some of those who passed through the Freedom's revolving door included Ken E Henson, Mick Jade, Barry Irwin, and Rabbitt's Ronnie Robot and Trevor Rabin. But it was the line-up of MacKay, Laxton, Davidson and Pratley, with Gerard Nel and Nic Martens, who joined forces with them to record Astra, that many regard as the apex of the band. Speak to anyone who knew the band and two people, the tortured genius Ramsay, for his words and music, and Julian, with his driving lead and magic black box, are credited with helping shape the band's unique sound. Looking back today, Colin Pratley, who with his wife runs a shelter for abandoned AIDS babies in Durban, remembers how Astra came together. "Ramsay had written words and music, there were the skeletons of songs and each of us put something of our own into the album. It was a mad weekend where all that counted was the music - and after three days we had Astra. "It was insane. At one stage Julian was kicking the echo chamber to get sounds that today with modern equipment, we would take for granted. This was Freedom's at its apex; it was the ultimate expression of its time, of the music and the lifestyle." There are many fans who believed that Astra, with songs like the Kid Who Came From Hazareth, the Homecoming and Slowly Towards the North, was based on the life of Jesus. Not so says Julian, who today owns his own rock club in Johannesburg and prefers playing stripped down blues rock: "It was a concept album, but the story about the album being about Christ is not true. But who knows what was in Ramsay's head when he wrote the songs. He was interested in many different things and read a lot, so he got his ideas from all over the place." The song Aileen - listed as Alien on the 1990 reissue - was written by Ramsay about a girl he once lived with, and Slowly Towards the North was - "I think" , says Julian - about his dream of one day returning to his native Scotland. But the origins of the other songs on the albums, says Julian are anyone's guess. "For all I know he may have read the bible at the time he wrote some of the songs, but I really do not know". Ramsay, returned to live in Scotland, where he still has a band, from many years ago. He seldom - if ever - granted interviews - and always let his music speak for itself. And then there was Brian Davidson, a slightly built man with one of the finest rock voices of his time. He was recruited from a soul band during a talent-scouting mission in Cape Town, soon after they returned to SA from England, Davidson, who went on to put together his own band many years later, died mysteriously in Thailand, where he was teaching English, in December 2002. "Brian was a bit like Robert Plant, he used his voice like a musical instrument," says Julian. "To this day I still cannot say how he managed to create some of his vocal sounds. The sounds on some of the tracks, some of the high harmonies, I honestly cannot say where they came from." 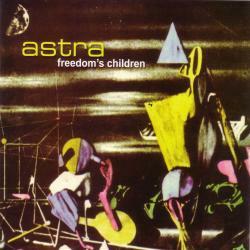 If ever there was an album that has stood the test of time, Astra is it. The music is as relevant and as powerful today as when it was released 34 years ago. The high point of a great band at its peak, so sit back and enjoy and feast your ears on the best of the very best. If ever there was a rock band around which a legend was created, then Freedom's Children were that band. Were they simply a broken-hearted horde writing psychedelic love songs? Were they galactic flyers in tune with astral days? Or were Freedom's Children just one of the best rock bands the world ever heard, or is it appropriate to say categorically that Freedom's Children were the best band the world never heard. An ironic suggestion, perhaps, but one with a lot of truth in it. That the circumstances surrounding their existence played against them does not detract from the fact that the original group formed in the year, in the world of music, that the ground was breaking. In contrast to the hit parade sounds of The Beatles, The Beach Boys and The Monkees, groups like The Grateful Dead, Jefferson Airplane and Pink Floyd were producing albums marked by their experimental creativity and music styles termed acid rock or astral music. In 1966, Ramsay Mackay and Colin Pratley had teamed up in Durban to experiment with their music ideas. In Cape Town they met Ken E Henson, who had been playing blues with Leeman Ltd., and together with Jimmy Thompson, of the same band, they began to perform as Freedom's Children. Their sound was acid-astral rock. South Africans had not been prepared for this group. The group created controversy and newspaper headlines, in every small South African town they performed at. Some towns banned them. But to those who understood quality rock, Freedom's Children provided their break with conventional thinking and music ideas. Julian Laxton replaced Ken E Henson on guitar in 1968 and Harry Poulos joined on keyboards. The group travelled to England but, perhaps for the reason that the group was from South Africa, and the politics of apartheid swayed opinion, the musicians were refused work permits and so their dream of attracting world acclaim faded. While the group returned to South Africa disillusioned, they began work on the recording of the 'Astra' album. The album provided the magic of a classic rock album. There were dramatic climaxes, socio-philosophical lyrics, hard, pulsating rhythms, blistering lead guitar solos, sense-riveting sound-effects and soaring vocals. A limited number of the album was pressed initially, and though the record was snapped up by their fans, the tragedy was that a fire at the EMI Warehouse destroyed the original master tapes of 'Astra' and further pressings, or reissues were, impossible to produce. But with the onslaught of modern technology, and a miraculous discovery of some master tapes, the reissue of 'Astra' was finally made possible. Ramsay Mackay left the group after the recording of 'Astra' and it was Julian Laxton who drove the band on their last album, 'Galactic Vibes', and where the music on it was still devastatingly good, the aura of 'Astra' had dissipated. Ramsay Mackay, Colin Pratley, Ken E Henson, Julian Laxton and Brian Davidson all carried on producing music in their respective forms and styles, through the Seventies and Eighties. But if the world of South Africa had been perfect, and had Freedom's Children achieved their breakthrough in England, one can only speculate how different the success of this group would have been. The world would have heard some good creative music. So as we slip the CD of 'Astra' into our hi-fis and turn up the volume, we can still appreciate some good creative music even if it is two decades later. All the drama, excitement and socio-philosophy is still there. Perhaps the sounds are in complete contrast to the sounds of the 90's but they are sounds, any listener, one who experienced their live performances then, or a recent convert to creative music, can find inspiration in. I most certainly find myself totally immersed in the sound and production of 'Astra', every time I listen. Special thanks to: Rob Allingham, Ben Segal (for supplying us with the original album sleeve), David Marks and Peter & Dave at Forest Studios for a job well done. Sleeve notes supplied by Kurt Shoemaker, September 2000. All songs written by Ramsay MacKay. When we first recorded this song, it was called 'The Kid That Came From Nazareth'. When the album 'Astra' was submitted to the SABC (Old Regime) for their playlist, they banned the album because of that track, as it was "Blasphemous". They said that if we changed all references to the word "Nazareth" including the recording, they would unban the album. So it was back to the studio and a re-recording of the lyrics as well as re-doing all the artwork. This was quite standard practice in those days. -- Julian Laxton, January 2001. This song was also recorded by Wildebeest and released on the Bushrock 1 album as 'Russian And Chips' (cleverly combined with a traditional Russian folk song). Piet Botha (Wildebeest bassist in the early 80s) performed this song as an unplugged version on his Summer 2001 tour. 'Russian and Chips' was covered by Jack Hammer (featuring Piet Botha) and released in April 2005 on the album The Pilgrim. Tribal Fence was covered by Rabbitt (featuring Margaret Singana) on their A Croak And A Grunt In The Night album. Margaret Singana herself also recorded a very powerful version of 'Tribal Fence' which is available on the Lady Africa compilation CD. 'Tribal Fence' was also recorded live by Wildebeest (featuring Piet Botha) and released on the Bushrock 1 album in 1981. In April 2005 'Tribal Fence' was covered by Jack Hammer (again featuring Piet Botha) and released on The Pilgrim. Slowly Towards The North was covered (and extended) by Hawk on their Live And Well LP in 1974. This track was also recorded live by Wildebeest and renamed 'Pofadder' when released on the Bushrock 1 album. The Homecoming: A live version of 'The Homecoming' (including a drum solo) was released on Galactic Vibes. 'Bushrock 1' [by Wildebeest, featuring Colin Pratley] was recorded live at Upstairs (Sunnyside, Pretoria) on 28 February and 1 March 1981. One tends to forget the great sounds Wildebeest produced with the interaction between the frentic violin of Dave Tarr and driving lead guitar of Boet Faber. I couldn't believe that I had forgotten that 'Bushrock 1' features 'Slowly towards the North' (as 'Pofadder'), 'The Kid He Came From Nazareth' (as 'Russian and Chips') and 'Tribal Fence'. South Africa's "Heavies": Take a listen to 'Astra', the tremendous Freedom's Children LP. The words and music were penned by Freedom poet and former bass guitarist, tall, long-haired Ramsay Mackay. Their sound - it's called "astrological rock" - is unique. It is really a pamphlet of our times. A colourful picture painted with sounds. USA For Africa: All of 'Astra' is a pleasure to listen to. Some songs are literally exciting, breathtaking, and so great that they reduce me to swear words for praise, like an inarticulate teenager praising his current heavy metal fave. The wall of sound is thick and palpable, a solid force. The music is creative and inspiring of strong emotion -- and trippy at the same time. Now I'm more of a fan than ever of Julian Laxton's guitar work and Colin Pratley's drum playing. Brian Davidson's singing is manly, confident, and self-assured. Now that I've discovered Ramsay MacKay, I think it a shame more of his work is not in print. This is clearly a superior album, and my thanks go to all involved, including Dave Marks, for making it possible for me to own it. What? Some of you all don't own this album? FIRST EVER! 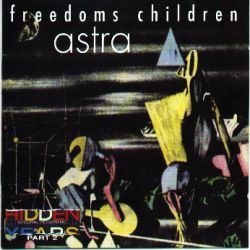 The Freedom's Children album 'Astra', was the first (and last) record to be released on all formats in South Africa. Nic Martens: When I returned to SA and went to EMI Studios (looking for work), Colin and Ramsay, who were starting the rehearsal and recording of 'Astra', asked me to join them on keyboards, and engineer the album. (I had one week to learn the entire repertoire). Working as recording engineer and musician was never going to be easy. What many are unaware of, is that Astra was recorded from a Friday night, to the Monday morning (no sleep for me), on a four track Studer, eight fader Siemans valve mixer, an echo plate, with some help from a Lesley amp and a modified echo box. There was no interference from the other members, so I was free to experiment and create as I felt.